بزرگان, نوید, میری, محدثه, وحیدی نیا, فرهاد. (1395). کاربرد نانو سیال آب- آلومینا گاما در مبدل گرمایی پوسته و لوله در غلظت های حجمی گوناگون. 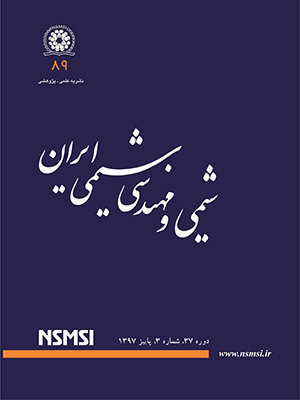 نشریه شیمی و مهندسی شیمی ایران, 35(2), 139-149. نوید بزرگان; محدثه میری; فرهاد وحیدی نیا. "کاربرد نانو سیال آب- آلومینا گاما در مبدل گرمایی پوسته و لوله در غلظت های حجمی گوناگون". نشریه شیمی و مهندسی شیمی ایران, 35, 2, 1395, 139-149. بزرگان, نوید, میری, محدثه, وحیدی نیا, فرهاد. (1395). 'کاربرد نانو سیال آب- آلومینا گاما در مبدل گرمایی پوسته و لوله در غلظت های حجمی گوناگون', نشریه شیمی و مهندسی شیمی ایران, 35(2), pp. 139-149. بزرگان, نوید, میری, محدثه, وحیدی نیا, فرهاد. کاربرد نانو سیال آب- آلومینا گاما در مبدل گرمایی پوسته و لوله در غلظت های حجمی گوناگون. نشریه شیمی و مهندسی شیمی ایران, 1395; 35(2): 139-149. در پژوهش حاضر، کاربرد نانو سیال آب- آلومینا گاما تا بیش ‌ترین غلظت حجمی %7 در مبدل گرمایی پوسته و لوله در شرایط جریان مغشوش به‌صورت عددی مطالعه شده است. در ابتدا، رابطه ‌های انتقال گرمای میان نانو سیال به‌ عنوان سیال خنک ‌کننده (سیال لوله) و آب (سیال پوسته) برای محاسبه ضریب انتقال گرما، ضریب انتقال گرمای کلی و توان پمپ کردن نانو سیال استخراج شده‌اند. در ادامه عملکرد مبدل گرمایی با درنظرگرفتن نانوسیال در قسمت لوله در شرایط جریان درهم بررسی شده است. در بیش ‌تر مقاله‌ های علمی به سودمندی کاربرد نانوسیال در مبدل‌ های گرمایی اشاره شده است اما در این پژوهش نتیجه‌ ها نشان می‌ دهد که افزایش چشمگیری در نرخ انتقال گرمای نانو سیال در جریان درهم دیده نمی ‌شود و بیش‌ ترین نرخ انتقال گرما در غلظت حجمی 026/0 و در حدود %5/4 نسبت به سیال پایه می‌ باشد. همچنین نرخ انتقال گرما با کاربرد نانوسیال با غلظت حجمی بیش از 026/0 رو به کاهش است. Choi S. U. S., Eastman J. A., Enhancing Thermal Conductivity of Fluids with Nanoparticles, "ASME International Mechanical Engineering Congress and Exposition", San Francisco, Calif, USA, 7 pages (1995). Das S., Choi S., Patel H., Heat Transfer in Nanofluids—a Review, Heat Transfer Engineering, 27(10): 3- 19 (2006). Wang X. Q., Mujumdar A.S., Heat Transfer Characteristics of Nanofluids: A Review, International Journal of Thermal Sciences, 46(1): 1-19 (2007). Wen D., Ding Y., Experimental Investigation into Convective Heat Transfer of Nanofluids at the Entrance Region under Laminar Flow Conditions, International Journal of Heat and Mass Transfer, 47: 5181-5188 (2004). Yang Y., Zhang Z.G., Grulke E.A., Anderson W.B., Wu G., Properties of Nanoparticle-in-Fluid Dispersions (Nanofluids) in Laminar Flow, International Journal of Heat and Mass Transfer, 48(6): 1107-1116 (2006). Xuan Y., Li Q., Investigation on Convective Heat Transfer and Flow Features of Nanofluids, Journal of Heat Transfer, 125: 151-155 (2003). Williams W., Buongiorno J., Hu L.W., Experimental Investigation of Turbulent Convective Heat Transfer and Pressure Loss of Alumina/water and Zirconia/water Nanoparticle Colloids (Nanofluids) in Horizontal Tubes, Journal of Heat Transfer, 130(4): 7-13 (2008). نوعی، سید حسین؛ حریری دیبا، فرزانه؛ نوعی، سید مصطفی؛ حسینقلی زاده، نجمه؛ زینالی هریس، سعید؛ بررسی تجربی عملکرد نانوسیال مس اکسید-استون بر بازده گرمایی یک ترموسیفون دو فازی بسته، نشریه شیمی و مهندسی شیمی ایران، (3) 32 : 31 تا38,(1392). Tiwari A.K., Ghosh P., Sarkar J., Particle Concentration Levels of Various Nanofluids in Plate Heat Exchanger for Best Performance, International Journal of Heat and Mass Transfer, 89: 1110- 1118 (2015). Rafee R., Entropy Generation Calculation for Laminar Fully Developed Forced Flow and Heat Transfer of Nanofluids inside Annuli, Journal of Heat and Mass Transfer Research, 1: 25-33 (2014). Kim J., Kang Y.T., Choi C.K., Soret and Dufour Effects on Convective Instabilities in Binary Nanofluids for Absorption Application, International Journal of Refrigeration, 30(2): 323-328 (2007). Pantzali M.N., Mouza A.A., Paras S.V., Investigating the Efficacy of Nanofluids as Coolants in Plate Heat Exchangers (PHE), Chemical Engineering Science, 64: 3290-3300 (2009). Mansour R.B., Galanis N., Nguyen, C.T., Effect of Uncertainties in Physical Properties on Forced Convection Heat Transfer with Nanofluids, Applied Thermal Engineering, 27: 240-249 (2007). Mohebbi K., Rafee R., Talebi F., Effects of Rib Shapes on Heat Transfer Characteristics of Turbulent Flow of Al2O3-Water Nanofluid inside Ribbed Tubes, Iranian Journal of Chemistry and Chemical Engineering (IJCCE), 34(3): 61-77 (2015). Pak B.C., Cho Y.I., Hydrodynamic and Heat Transfer Study of Dispersed Fluids with Submicron Metallic Oxide Particles, Experimental Heat transfer, 11: 151-170 (1998). Xuan Y., Roetzel W., Conceptions of Heat Transfer Correlation of Nanofluids, International Journal of Heat and Mass Transfer, 43: 3701-3707 (2000). Corcione M., Empirical Correlating Equations for Predicting the Effective Thermal Conductivity and Dynamic Viscosity of Nanofluids, Energy Conversion and Management, 52(1): 789-793 (2011). Kakaç S., Liu H., "Heat Exchangers: Selection, Rating and Thermal Design", CRC Press, United States, 2nd ed., (2002). Li Q., Xuan Y., Convective Heat Transfer and Flow Characteristics of Cu–Water Nanofluid, Science in China Series E: Technological Sciences, 45(4): 408-416 (2002). Incropera F.P., DeWitt D.P., "Introduction to Heat Transfer", 4th ed. John Wiley and Sons (2002). Esfe M.H., Saedodin S., Mahmoodi M., Experimental Studies on the Convective Heat Transfer Performance and Thermophysical Properties of MgO-Water Nanofluid under Turbulent Flow, Experimental Thermal and Fluid Science, 52: 68-78 (2014). Lelea D., The Performance Evaluation of Al2O3/Water Nanofluid Flow and Heat Transfer in Microchannel Heat Sink, International Journal of Heat and Mass Transfer, 54(17-18): 3891-3899 (2011). Jwo C.S., Jeng L.Y., Teng T.P., Chen C.C., Performance of Overall Heat Transfer in Multi-Channel Heat Exchanger by Alumina Nanofluid, Journal of Alloys and Compounds, 504: S385-S388 (2010). Williams W.C., Buongiorno J., Hu L.W., The Efficacy of Nanofluids as Convective Heat Transfer Enhancing Coolants for Nuclear Reactor Applications, "Proceedings of the 2007 ANS Meeting", Boston, Jun. 24–28 (2007). Davarnejad R., Mohammadi Ardehali R., Modeling of TiO2-Water Nanofluid Effect on Heat Transfer and Pressure Drop, International Journal of Engineering, 27(2): 195-202 (2014).